The 10-inch Calphalon Griddle/Crepe pan should not be limited by its name. Certainly, crepes will easily slide out of this pan with its gently sloping sides. And the non-stick surface should make flipping pancakes as easy as flipping a coin. But, don't limit yourself. You can just as easily use this pan for grilling paninis, sauteeing vegetables, or making an omelet. The non-stick surface should make any of those endeavors go smoothly. Another bonus to the pan's non-stick surface is that it allows you to cook low-fat meals; there's no need for oil or butter with this pan. 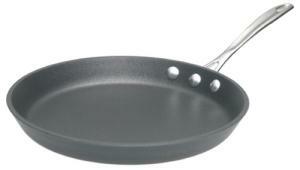 Beneath the reinforced non-stick surface is a hard-anodized exterior which enhances the pan's durability. And beneath that is an aluminum core which allows for rapid and even heat distribution. Best of all, perhaps, is that the Calphalon Griddle/Crepe pan comes with a life-time warranty. Be careful, though. If you use metal utensils or abrasive cleaners on the pan they may damage it and may void the warranty. Is this pan any better or any worse than any other griddle or crepe pan? That depends in part on use. Personally, I don't care for those crepe pans that have no sides, because they can't be used for anything else. But those griddles that cover two burners? Those I do like because you can have a lot more pancakes done at the same time so your family doesn't have to eat in shifts. What you plan to use this pan for certainly effects how useful this pan will be to you. It's not the only griddle/crepe pan out there, and it may not be a superstar. But it's a good, solid pan. And like I said, it comes with a lifetime warranty. For a pan with pre-set grill marks, see the Calphalon Contemporary Panini Press.